A study just published on June 11, 2018, shows a reduced number of conceptions for 25-29 year old women who received HPV vaccinations. The FDA was also aware of autoimmune disorders that appeared during clinical trials. The FDA approves all language of inserts. Read the following carefully. Merck’s Gardasil 9 insert (excerpt above) mentions rates of new systemic autoimmune disorder in subjects and claims they were similar to “saline placebo” rates in historical clinical trials for Gardasil. Or do they? Look carefully at the actual language on the insert — “. . . which were similar to rates reported following GARDASIL, AAHS control, or saline placebo . . .” (emphasis added) . The word “or” was very carefully chosen for legal purposes by Merck and is extremely deceptive. The clinical trials included just one small saline placebo group and these results were rolled into aluminum adjuvant “AAHS” groups. Notably, none of those in the saline saline group died, and NONE OF THE SUBJECTS IN THE SALINE PLACEBO GROUP DEVELOPED A NEW AUTOIMMUNE DISORDER. In the other clinical trials, out of 29,000 subjects, there were 40 deaths – evenly split between the Gardasil group and the AAHS (a potent aluminum adjuvant) group. The death rate was 1 in 733; 1 in 718 if you subtract the saline placebo group. SEE CRITICAL DATA ON ALUMINUM ADJUVANTS. Human papillomavirus (HPV) is the most common sexually transmitted infection in the United States. There are more than 200 strains (and counting). In the vast majority of cases it causes no health problems and completely clears on its own. 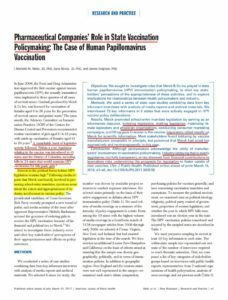 An Independent Journalist writes about the current state of HPV vaccine around the world: Are We Seeing a Global HPV Vaccine Fraud Implosion? It takes on average 30 years for cancer to develop in the rare cases when HPV infection does lead to cancer. The impact of vaccination programs is not yet known. Strain replacement has been found to occur. There are more than 200 strains of HPV. 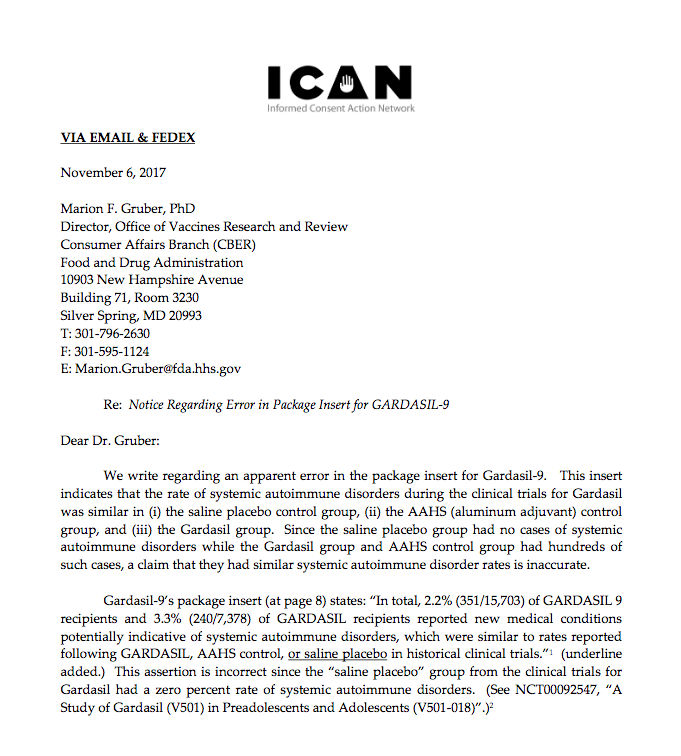 While the current Gardasil9 vaccine protects against what are thought to be the strains leading to the most cancer, It is not known what impact other strains may have on cancer rates or on other health conditions. “The number of studies that show that partial immunization via available HPV (human papillomavirus) vaccines is not only insufficient at reducing overall HPV infection rates; the vaccines actually cause rarer, more lethal types of HPV to sweep in and the net effect could be devastating increases in HPV-related cancers.” Dr. James Lyons-Weiler. Human papilloma virus and lupus: the virus, the vaccine and the disease. 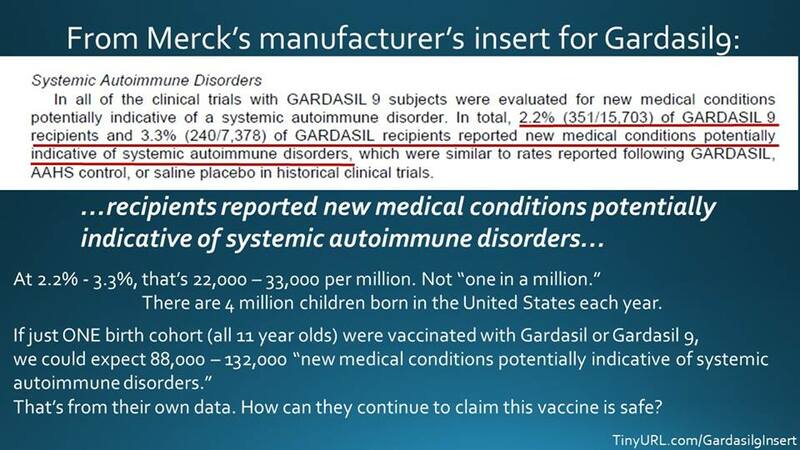 Gardasil 9: Each 0.5-mL dose of the vaccine also contains approximately 500 mcg of aluminum (provided as AAHS), 9.56 mg of sodium chloride, 0.78 mg of L-histidine, 50 mcg of polysorbate 80, 35 mcg of sodium borate, <7 mcg yeast protein, and water for injection. Study V503-001was a Phase 2b/3 efficacy study that enrolled 15,457 women 16through 26 years of age and randomized to receive GARDASIL 9 (low-dose, mid-dose, high-dose) or GARDASIL (comparator). The optimal dose for further investigation was defined as the “mid-dose.” This study demonstrated efficacy of 96.7% in terms of prevention of combined genital lesions (CIN2+, VIN2+, orVaIN2+) attributed to the 5 additional HPV types not present in GARDASIL. Study V503-002was an– immunobridging study linking clinical efficacy obtained from Study V503-001 to 955 children 9 through 15 years of age. Evaluation of clinical efficacy was not feasible because performing genital examination in this population in the absence of the primary endpoint was not justifiable. Non-inferiority was demonstrated for all 9 vaccine HPV types, and lot consistency criteria were also met for the 9 vaccine HPV types.